It’s been 10 years since the day I met and recorded Bob McElroy. Who the Hell is Bob McElroy? Bob McElroy was a musician I met while living in at the Santa Fe International Youth Hostel in 1999. He was in town from Monroe, Louisiana to meet with Gary Johnson, then-governor of New Mexico, on the topic of marijuana decriminalization legislation. To this meeting he dressed in an all-white suit with a bolo tie, which at 78 years old, scruffy beard and head of white hair, made him look too much like Colonel Sanders for comfort. Later that night, I found him in the common room singing folk songs to an audience of touring Japanese girls. I asked if I could record him and he was happy to oblige. I immediately ran to Radio Shack, purchased a cheap boundary microphone that I could connect to my MiniDisc recorder, grabbed a six pack of Lone Star talls at the pharmacy, ran back to the hostel and sat Bob down outside the hostel kitchen where he played and I recorded until quiet hour. Not everything he said was the truth, but enough was. Bob was an extremely interesting person. A former member of a biker gang and psychedelic enthusiast. With his skepticism of organized religious ideals and anti-establishment attitude he’s exactly the type of person you’d expect to meet while living my life. As he puts it while talking about being “locked up for crazy,” “[Mad houses are] all about separating out people who are constitutionally opposed to following the rules other people have set down.” Or when I ask him to play the song where “the bad guy gets away at the end” he retorts, “the cop’s the bad guy.” He had a special way of looking at things that resonated with me. I didn’t want to be him, or even spend a lot of time with him. That evening, extended for ten years by recording technology, was all I needed. Bob died in 2002. It’s my pleasure to share the entire evening’s recordings with you. This was written by Ian. Posted on Friday, December 18, 2009, at 3:58 pm. Filed under Art, Family, Friends, Music, Vacation. Bookmark the permalink. Follow comments here with the RSS feed. Trackbacks are closed, but you can post a comment. You have such a way with words, I think possibly even better than your Dad or at least on par. Enjoyed hearing about Bob. I knew Bob when I lived in Monroe, Louisiana. He was sui generis, to say the least. 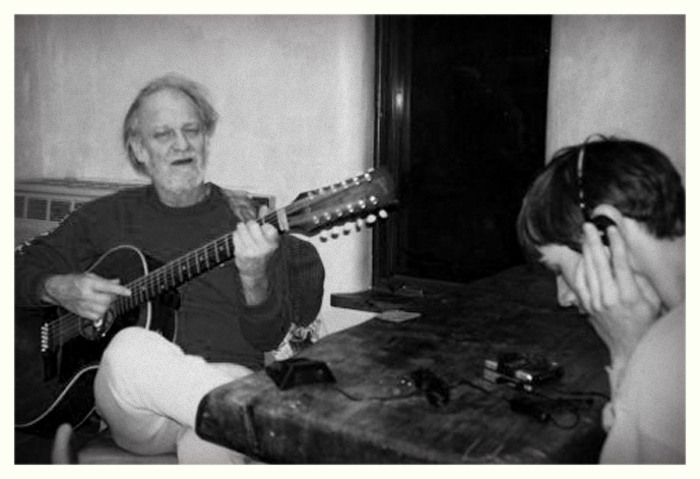 Bob was a good friend and was a living definition of the word troubadour. He was definitely eccentric but was also a very kind man and was both a member of MENSA as well as the Discordian Society. At a moments notice he could play any one of thousands of songs from memory on either piano or guitar. Again, thanks! It’s good to hear him again.